From the comfort of your keyboard, browse the mineral wonders unique to the cave environment. We've collected images from around the world and combined them to generate an 'ideal' cave. Simply click on the feature you wish to visit, and let your mouse do the crawling! N E W S F L A S H ! and info on how to purchase slide sets featuring some of the images from the Virtual Cave. Visit mysterious animal tracks deep inside a Central American cave. European visitors may get faster access to the Virtual Cave via its mirror site in Italy. 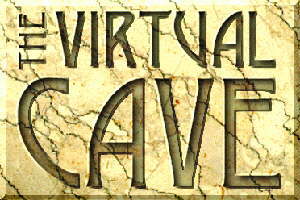 Thanks for visting, Virtual Caver # ! Drop in again!